I am not sure why the prices of Hinderers have dropped. It may be due to increased manufacturing capabilities so that supply actually begins to meet demand. Or perhaps the company is facing pressure from the rise of mid techs and high end Chinese knives. Or maybe it has something to do with excellent Hinderer / ZT collabs like the 0562CF driving down demand? This is great news, regardless of the cause of the price drop. Personally, the reduction in price has allowed me to carry and use my 3″ XM-18. Don’t get me wrong, I carried and used my 3.5, but after shelling out over $500 for it I was pretty ginger with the knife. Plus it was really too big for me to carry regularly. I eventually sold it off. Now that the prices have come down to earth, I picked up a 3″ version of XM-18 to try. 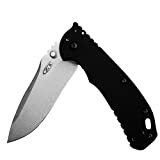 The XM-18 3″ has an overall length of 7″, a 3″ blade, weighs 3.6 ounces, and is made in the USA. While the XM-18 3.5 is an impressive piece of hardware, it is hardly an every day carry (EDC) item in my book. It is built like a tank, with a thick slab of titanium, meaty blade, and over-sized stand offs. The 3.5 is a much more substantial knife than the 3. The 3″ version of the XM-18 is better for my minimalist style of daily carry. As a result this knife has been getting a ton of pocket time. I would consider this to be either an EDC knife, or a collectible. Hinderer used to only offer the production XM in a drop point (with a spanto or “slicer” grind). Over the past year or two they have rolled out a number of different blade shapes including a clip point, “skinner”, and the wharncliffe version shown here. Rick’s wharncliffe design has grown on me. The shape is attractive and the blade has been executed flawlessly. The knife is ground thin and cuts well. The edge is about as neat of an edge as I have seen. The grinds are crisp and the stonewashed finish is subtle. My XM came in S35VN stainless steel – just like the blade on my 3.5, the new Chris Reeve knives, and a number of other higher end offerings I have sampled. So at this point I am very familiar with S35VN as a blade steel, but I have still taken the time to put this knife through its paces. This XM-18 has spent many weekends clipped to my pocket, and has broken down innumerable boxes, and assisted with home improvement tasks. I like the combination of S35VN steel and wharncliffe blade; this is like the worlds most expensive box cutter. The blade tracks easily through material, and the straight edge results in pressure being uniformly applied throughout the entire cut. The absence of belly means that this won’t be a great hunting or filet knife, but the straight edge is useful for a lot of other jobs. I have had zero issues with corrosion and have not much need to sharpen (although it certainly dulls after use – this isn’t some miracle steel). I have mostly maintained the edge on my strop and it continues to shave hair and push cut paper with regular maintenance. S35VN is excellent stuff, and you will find the 3″ XM in S35VN to be a capable cutter. Handle construction of the XM-18 3, follows Rick’s pattern of titanium lock side, custom stainless steel standoffs, titanium liner and G10 handle scale. A slotted pivot helps hold it all together. Everything has been executed with surgical precision. The titanium on my model has been stonewashed and has held up well. The filler tab is flush with the handle. Every detail has been carefully considered and masterfully executed. What I especially enjoy about the 3″ version of this knife is how light the handle is. It is significantly lighter than the 3.5, and despite everything being over built the knife still tucks away neatly into the pocket. The XM series includes one of my favorite ergonomic features: the forward finger choil. As demonstrated on some of my all time favorites like the Paramilitary 2, American Lawman, and Sage 1, this forward choil gives the user several options in gripping the knife. I find myself using the choil for detail work, and not using it when breaking down a box or engaged in an extended cutting chore. If you ignore the forward choil, the rest of the handle is plenty adequate for a full grip, and the simple shape naturally conforms to the hand. There is a run of jimping on the spine. The jimping is wide, and it strikes a good balance between providing traction and not shredding your thumb. The corrugated G10 handle scale and jimping by the pommel provides additional traction. This little XM is not going to fall out of your hand easily. The 3″ XM features the same titanium pocket clip found on the rest of the XM line. It’s a spoon style clip that fits into a recess machined into the handle. This is not a deep carry clip, but when mounted for tip up carry the knife buries into the pocket decently. While it isn’t my all time favorite clip design, it certainly works. The clip has good retention and is reasonably discrete. The handle has been milled for right side tip up or tip down carry, and a “filler tab” is included to cover up the recess in the handle. I like the way the 3″ XM carries. It feels even lighter than it’s 3.6 ounces would suggest, and the knife is as thin as my beloved Sage 1. For these reasons the 3″ has been getting a lot of pocket time, and it has proven itself to be a viable EDC option for me. Hinderer sells the 3″ XM-18 in flipper and non-flipper variants. I have a flipper version, but it might as well be a non-flipper. The flipping action is pathetic. The blade barely makes it out to half mast – even when preloading the flipper. This is a shame. I still like the knife, but when you consider that a $30 Swindle flips better than this, it makes you wonder what is going on at Hinderer HQ. 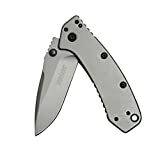 I have heard rumors that Hinderer was going to fix the weak detent on their new knives. I am not sure when this wharncliffe was made, but I don’t think they have been offering the blade shape for longer than a year. Thankfully, thumb studs are also included on the knife, and they can be used to “coin flip” the blade open. All XMs come with teflon washers, and my little 3″ is no different. The action is smooth, but personally I still prefer phosphor bronze (and suspect bronze washers would help the action). The titanium framelock on this knife is extremely nice. It engages early and without stick. There is no blade play and the blade is perfectly centered. Hinderer has this part down to a science and it shows. This is an excellent framelock and it is certainly up for heavy cutting. Blade centering on my knife is perfect. The high end titanium framelock flipper market has become fiercely competitive over the years, and shows zero sign of slowing down. Hinderer’s XM series has long been considered a gold standard for titanium framelock knives and high end carry pieces. If you get your hands on one it will not take long to understand why. The knives are beautifully made to exceptionally high tolerances. Although the prices have dropped these are still far from cheap. Most people reading this probably think I am nuts to own a $400 knife, and that is OK. I’ll spare everyone the “value” discussion – either you want an XM (and are willing to pay for it) or you don’t. But at close to MSRP I think these are excellent knives, built extremely well, and I am surprised at how much I have enjoyed the 3″ XM. I bought it on a whim, and it has won me over. This is a great high end EDC option because it carries and cuts well, and oozes quality. I just wish the flipper actually flipped. That would be the cherry on top of this knife sundae. But as it stands there is still a lot to enjoy. 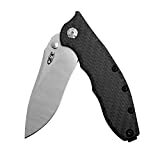 This is a rugged no-nonsense tool that will serve it owner well for many many years, and I think the 3″ version is practical for a normal guy to EDC if you can get around the price tag and sub-par flipping action. Recommended. KnifeArt has a great selection of XM-18s, and occasionally they pop up on BladeHQ as well. And lately, they have been popping up on Amazon too. I recommend purchasing them at these retailers. Please consider that purchasing anything through any of the links on this website helps support BladeReviews.com, and keeps the site going. As always, any and all support is greatly appreciated. Thank you very much.